Check the manufacturer’s website for coupons and discounts: For our $65 prescription, I googled the name of the drug and found their website. They offer a coupon good for one year that will take 50% off the co-pay price, as long as your insurance is okay with you using coupons. Next time I’m at the pharmacy, I’m going to see if they’re able to apply the coupon to this prescription. That will save us $50/month just on that one drug alone! 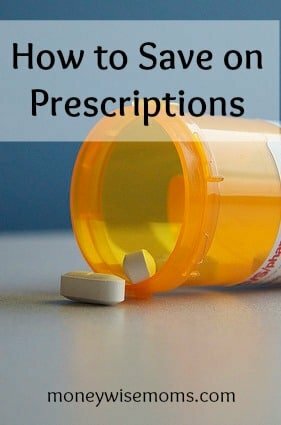 Compare prices at other pharmacies: For generic prescription drugs, it’s worth calling around to other pharmacies to see what they charge; you may be able to pay $3-4 instead of your usual $10+ co-pay. Fortunately, the pharmacy I’m using already charges us the cost of the drug or our co-pay, whichever is lower, so I’ve paid as little as $2 rather than our $10 co-pay. Ask your doctor for samples: All three of my kids are asthmatic, so each time we go for their quarterly checkup, I ask our pulmonologist for samples of their maintenance drugs. Since many are brand-name (and therefore more expensive within our plan), those samples save us a month or more’s expense each time. Every little bit helps! Our doctor has also worked to get my kids off allergy meds during the months they don’t need them, giving both their bodies (and our budget) a break. I’m concerned about how these rising costs will affect our budget for next year, so I’d love to hear from you! What other ways do you save on prescriptions? Our insurance company offers a mail order service. We use that for most of the daily medications that my kids take, and the copay is less than if we would get refills at the regular pharmacy. Great point, Natalie. I know I’ve gotten info in the mail about that, but I was feeling intimidated about having to switch them all over (four of us are on monthly meds). I’ll look into it! All of mine are mail order. Typically there is one long family history file that you have to fill out only once. Save it so you can copy if you ever have to change insurance companies. Usually you can then renew online with only a recertification of the family health file once a year. You can also set up reminders for refills or have it autofill when it’s time. Plus you can typically put all the prescriptions for all family members in at once (assuming you have all the paper copies to mail). It’ll take a couple weeks to get in your account, but you can then log in and fill them individually if you want. I don’t consider it a big financial savings, but it IS magical to log in anytime and fill whatever whenever and then it just magically appears on your doorstep. due to my recent diagnosis of melanoma at age 28 i am without insurance until jan 2014 and i have been using an app on my iphone called goodrx … i am able to find the current pharmacy prices at each pharmacy location. An rx that cost me $225.00 only cost me $120.00 at harris teeter as opposed to the $225.00 wags charged. This app has been a life saver to say the least- i hope this info helps! Thanks for the recommendation! It looks like you can use GoodRX online as well as an app. I just went to http://www.goodrx.com and found the info.